We teased yesterday the big mistake that Mike Frerichs made in the release of his latest infographic. And today, we're here to share it with you. This is the latest in a long (unbelievably long, actually) string of mistakes and errors coming out of the Mike Frerichs campaign. Based on their record, one can only assume that they're either very lazy or just plain dumb. Either one is a bad trait for a politician. 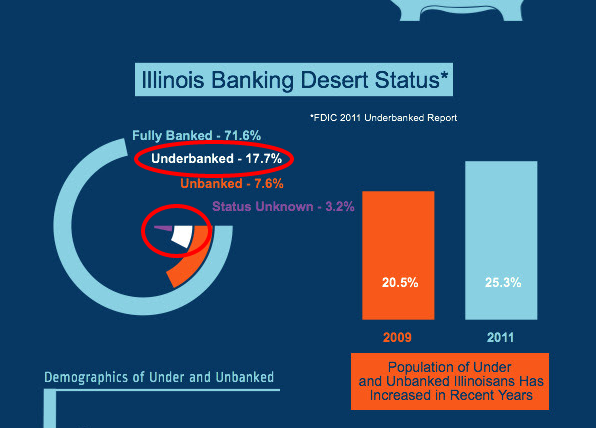 If 'underbanked' is 17% of the population of Illinois, why is that segment of his 'pie chart' smaller than the orange 'unbanked' population - which he claims to be 7%. Shouldn't the white segment be a bit bigger? And the orange one smaller? Attention to detail is NOT something they teach at Yale, we guess. Germanic Studies FTW!